Please read the Workshop FAQs for more information. Study Balboa and Bal-Swing with four international champions of the dance: Andreas Olsson (Sweden), Gio Olla (Italy), Adam LaMontagne (USA) and Sanna Leinonen (Finland). You will rotate partners in class. These classes will suit Intermediate to Advanced Balboa dancers. At the beginning of the first session, the teachers will split the group into two smaller tracks by dance level. Study Lindy Hop with world champion dancers and master instructors: William & Maeva (France), Ali & Katja (Germany), Pontus & Isabella (Sweden), and Max & Alice (France). You will rotate partners in class. There are two level options: Intermediate-Advanced (mornings) or Advanced (afternoons). At the beginning of the first session, the teachers will split your group into two smaller tracks by dance level. Int/Adv schedule: Saturday 10.00am-2.00pm, Sunday 11.00am-2.30pm. Advanced schedule: Saturday 2.15pm-6.15pm, Sunday 2.45pm-6.15pm. Study solo jazz dancing with four of today’s top competitors and masters of Jazz Roots: Remy Kouakou Kouame (France), Tatiana Udry (France), Juan Villafane (Argentina) and Pamela Gaižutytė (Lithuania). This workshop will suit Intermediate to Advanced solo jazz dancers. At the beginning of the first session, the teachers will split the group into two smaller tracks by dance level. On Friday take a fun 2-hour powerclass focused on moves, moves, moves! Instructors JB Mino (France), Tatiana Udry (France), Juan Villafane (Argentina) and Alice Mei (France) – all known for their impressive moves and fancy feet – will give you as many cool Lindy Hop moves as you can handle in 2 hours. You will rotate partners in class. This workshop will suit Intermediate/Advanced Lindy Hop dancers. At the beginning, the group will be split into two smaller groups according to dance level. On Friday afternoon, take a 2-hour solo jazz dancing workshop with two of Europe’s top female Jazz Roots dancers and competitors – Tatiana Udry (France) & Pamela Gaižutytė (Lithuania). This workshop will suit Intermediate to Advanced solo jazz dancers, both men and women are welcome to attend. At the beginning, the group will be split into two smaller groups according to dance level. Work on solo dancing that mixes authentic jazz dance roots with Hollywood style from the silver screen! Channel Fred Astaire, Gene Kelly, the Nicholas Brothers and other Hollywood heroes of the swing era, with the ever-stylish Vincenzo Fesi. All levels welcome. Collegiate Shag was an incredibly popular swing dance in the classic era and is currently experiencing a revival worldwide. It’s bouncy, fun and can be danced to fast tempos! Enjoy a taster with two legends of the dance, Marcus & Barbl, who will show you the basics for a strong foundation to get you shagging all weekend long! No shag experience needed, all welcome. You will focus on the fundamental principles and techniques of delivering perfectly balanced and controlled movement in your dancing, through simple practice drills and exercises. We will then start to fit rhythmic footwork patterns and use different and stylish types of spins and turns you can do in partnered and solo dancing. Don’t miss this chance to take a class with the very inspiring Trish Sewell! All levels welcome. Are you a Lindy Hopper looking for practical ways to improve your movement abilities and reduce the risk of injury? Based on functional training methods, Ron will explore the main human movement patterns, try some simple and effective exercises, learn how to warm up before dancing, receive tips about stretching properly and see how we can easily incorporate training into our daily routines by using our immediate environment – to keep ourselves in shape. No experience needed, all levels welcome. Learn how accents play a part in both swing music and dancing, and play with rhythmic variations that feel right to the music, while adding style and flare to your Lindy. Don’t miss this chance to learn from two of France’s most stylish rhythm dancers, Remy and Alice! For Beginner-Intermediate to Intermediate level Lindy Hop dancers. Join world-renowned jazz dancer and mischief maker Mikey Pedroza for a fun jazz routine, drawing on classic steps that every swing dancer should know. Guaranteed good times! Suitable for Beginner-Intermediate dancers and above. A steal jam is a Lindy Hop jam session where the only way to get in the circle is to steal the partner currently dancing with someone else! A great skill to have for birthday jams, plus a super fun game to play with friends on the dancefloor. Both leaders and followers can learn how to steal a partner, in a clever and smooth way that doesn’t interrupt the flow of the dance. Learn how to steal your way into a jam, with the best thief in the world – Thomas Blacharz! This class is for Intermediate dancers and above. Back by popular demand, two of the Lindy Hop world’s top aerialists are offering a 2-hour airstep taster at ESDC! Lindy Hop is known for its acrobatic & gravity defying air steps, and you will see plenty on display in the ESDC competitions. Patrick & Natasha will teach you a number of classic introductory Lindy Hop airsteps, in a safe and controlled environment. You will learn to execute acrobatic manoeuvres with your partner, with safety, power and style. You must sign up with a partner, ideally someone you dance with regularly, that you trust and are comfortable with. You must both be uninjured and in good shape. Please wear clothing that you have a full range of movement in, but is not too baggy. Preferably a long-sleeved top and sweats or yoga leggings. Please wear your flat dance shoes, or you can wear padded sports shoes/sneakers. All levels welcome, no experience needed. Come work intensively on your Lindy Hop technique with Remy & Alice! Technique is about clear communication, feeling good to your partner, and trimming away inefficient and unnecessary movement and tension. And there’s a bonus – good technique makes you look good too! Be ready for feedback on your fundamentals, as Remy & Alice test you out and give you drills and exercises that will help take your dancing to the next level. Remy & Alice will look at the group and tell you what you need most, right now, to improve your Lindy. This class is for Intermediate Lindy Hoppers. 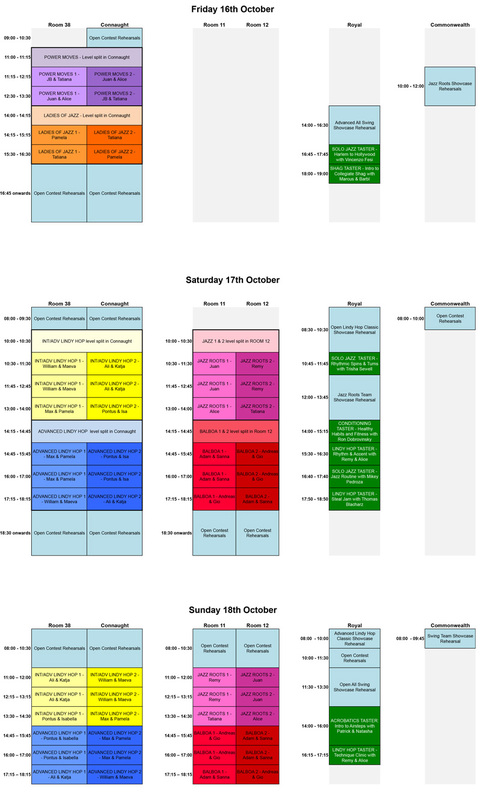 Note: Some activities on the ESDC 2015 schedule overlap. Please read the event schedule carefully to make sure your chosen workshops and competitions do not clash.